Good Grief!! It can’t be November already, can it?! Well, of course it can. I just have to face the fact. The important fact to face today is that it’s time for Strange But Good-hostessed by the lovely Laura at Sprint 2 The Table. For all of us who eat strange things, this is the place to be. Be sure to check out what everyone else is posting today. As I’ve said before, so many times my Strange But Good foods tend to go hand in hand with my own theme, Couldn’t Be Quicker. They come up when I have neither the time or the ingredients to make anything else. This seems to be the case this week. 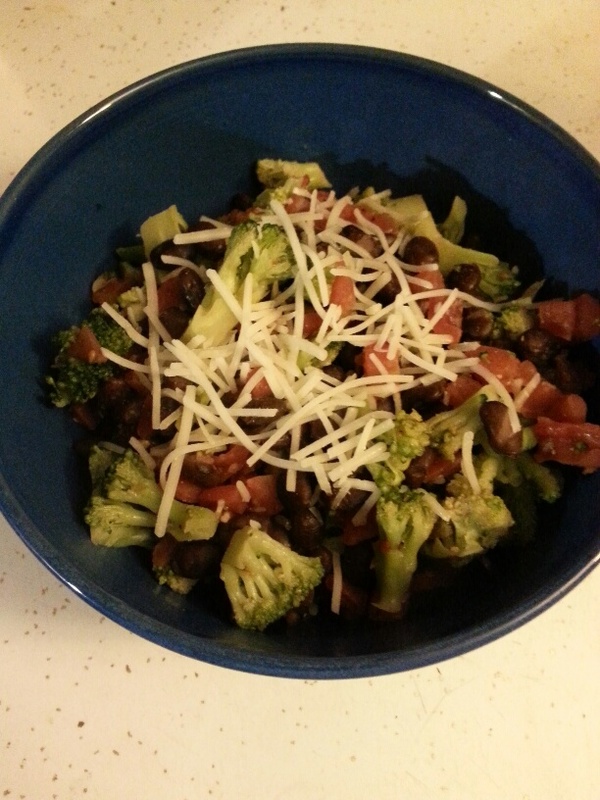 What do you get when you combine a can of diced tomatoes with green chiles, a can of black beans and frozen, microwaved broccoli? A meal in 10 minutes or less. This is not the best photo because it was dark out AND I was hungry therefore too impatient to fuss with it anymore. I thought of sautéing up an onion first and adding some garlic, but why bother. Just added some garlic powder and Mrs. Dash. Topped it with some Romano cheese and called it dinner. I was really only expecting this to fill me up, I wasn’t expecting much else from it. However, this was delicious. Luckily, it’s easy to have all of the ingredients on hand so I’ll probably be doing it again. 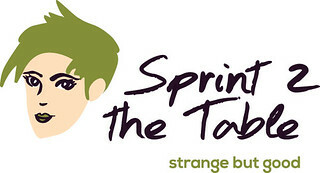 Be sure to check out the other great Strange recipes over at Sprint 2 The Table. Why not share some of your strange foods there. It’s fun and you’ll get some surprisingly good ideas. This entry was posted in Uncategorized and tagged Couldn't Be Quicker, Strange But Good. Bookmark the permalink. Do you have any tips on cooking eggplant ? Oh, boy, Bob. I Love eggplant. I’ll look into getting some recipes for you. But my two favorite ways is just chopping it up and either sauteing it with other veggies…onions, bell peppers, garlic, mushrooms or whatever you like in a big pan. Add spices that suit your fancy. I like Mrs. Dash, lots of ground black pepper and sometimes something fancier like cumin. I also love to roast it. You can use the same method-chop it up, combine with whatever other veggies you have or like. I combine in a big bowl with a tiny bit of olive oil-usually just a tablespoon or so then salt, pepper, garlic powder and whatever spices or herbs you like. Basil is good for me. The roasting adds a wonderful flavor you don’t get from the sauteing. I love to toss it either way with some pasta, rice, quinoa or any grain. Then top with, for me Pecorino Romano cheese or parmasean is good too. I’ll find you some recipes though, too. Let me know how it works! That is certainly a consideration, Liz! I was actually surprised at how good this was. Sometimes the easiest things are the best. Have a great day! I’m not usually a broccoli fan, but this looks intriguing. Are you doing NaNo again this year? Glad it looks good, Melonie. I’m not doing NaNo this year. Are you? I’m to involved with clearing out the house and packing hopefully for our move sometime in 2014. Maybe next year. Good to hear from you. Take care and good luck! I love a quick and easy #strangebutgood! I’m totally guilty of adding onion and garlic powder when I’m in a hurry – all the flavor in half the time! Thanks for linking this up. Have a great weekend, Fran! Thanks, Laura! Amazing how good something quick and strange can be. Enjoy your weekend! I love quick go to meals, especially after a long day at the office. Good stuff Fran. Thanks, Ms. Meghan! Have a great weekend.